If you are thinking of living in the Southeast quadrant of Leon County, then it is very likely you will be looking at homes in the Southwood community. With more than 2,000 homes on over 3,000 acres, Southwood is the hub of SE Tallahassee real estate activity. As a master planned community, Southwood is feature rich and offers homes from just below $200K on up to more than $1M. In this report, we will look at average home prices, home values, and home sizes in Southwood, as well as show current listings in the Tallahassee MLS and all closed home sales going back to when sales first began in Southwood. It is important to note that the narrative contained below is for sales through December for all previous years, but through the the fourth week of March in 2016. 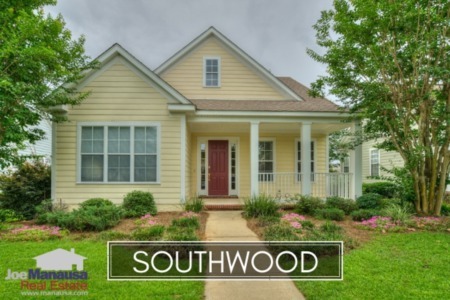 The graphs and the closed sales table will be continuously updated into the future (meaning bookmark this page if you always want to know the current status of homes in Southwood). Southwood home prices are about 3% higher in 2016 than the overall average in 2015, which is just a little lower than average prices in 2012 and 2013. With very low mortgage interest rates still available for homebuyers, these lower prices are the primary driver of healthy sales in Southwood. The activity in the Southwood housing market remains robust, as 2016 appears to have continued where 2015 left off. As of this writing, there are 66 homes for sale in Southwood which represents 4.5 months of supply ... a condition that strongly favor sellers. One third of these homes are already under contract, so expect to have to compete for the lower priced homes if you are buying in Southwood. Average home values in Southwood, contrary to average home prices, rose last year and continue to rise in 2016. Through the fourth week of March, the average value of a home sold in Southwood has been $143 per square foot. The strength of growth since 2010 has been phenomenal, and Southwood is now enjoying its highest average home values ever. The average home size sold in Southwood falls in a range of 1,900 to 2,300 square feet, and 2016 is seeing homes right in the lower-middle of this range. The 38 home sales thus far in 2016 have averaged 2,018 square feet, which is a slight decline when compared to last year. * Report fluctuations: Unlike most neighborhoods in town, Southwood still remains active with new construction. It is not uncommon for Leon County to record new construction sales while omitting information on square footage, so some of the home sales in this report show homes with zero square feet and thus zero "value." We update sizes as the information becomes available. 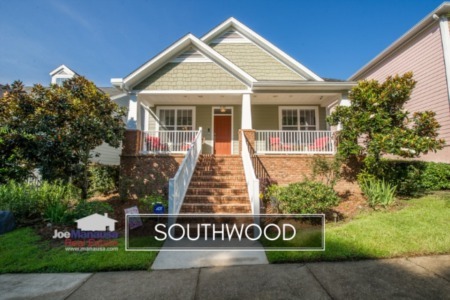 The following map and list of homes feature all of homes for sale in Southwood. The following list shows all home sales in Southwood going back to its first year of sales in 2001. I hope you enjoyed our March 2016 update on home sales in Southwood, please feel free to drop me a note if you have questions not covered in this report.